Frozen custard is a cold dessert similar to ice cream, but made with eggs in addition to cream and sugar. It is usually kept at a warmer temperature compared to ice cream, and typically has a denser consistency. Frozen custard chains in the United States include Culver's, headquartered in Prairie du Sac, Wisconsin, with outlets in 20 states; Freddy's Frozen Custard & Steakburgers, based in Wichita, Kansas, with more than 300 locations nationwide; Andy's Frozen Custard, based in Springfield, Missouri, with over 70 locations in 13 states; Ted Drewes Frozen Custard in St. Louis, Rita’s in Southern California and Abbott's Frozen Custard, in Rochester, New York. In the U.S., the Food and Drug Administration requires products marketed as frozen custard to contain at least 10 percent milkfat and 1.4 percent egg yolk solids. If it has a smaller percentage of egg yolk solids, it is considered ice cream. True frozen custard is a very dense dessert. Soft serve ice creams may have an overrun as large as 100%, meaning half of the final product is composed of air. 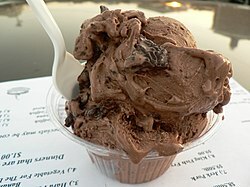 Frozen custard, when made in a continuous freezer will have an overrun of 15–30% depending on the machine manufacturer (an overrun percentage similar to gelato). Air is not pumped into the mix, nor is it added as an "ingredient" but gets into the frozen state by the agitation of liquid similar to whisking a meringue. The high percentage of butterfat and egg yolk gives frozen custard a thick, creamy texture and a smoother consistency than ice cream. Frozen custard can be served at −8 °C (18 °F), warmer than the −12 °C (10 °F) at which ice cream is served, in order to make a soft serve product. Another difference between commercially produced frozen custard and commercial ice cream is the way the custard is frozen. The mix enters a refrigerated tube and, as it freezes, blades scrape the product cream off the barrel walls. The now frozen custard is discharged directly into containers from which it can be served. The speed with which the product leaves the barrel minimizes the amount of air in the product but more importantly ensures that the ice crystals formed are very small. ^ a b Brienza, Laura (2015). "Discovering Vintage Washington, DC: A Guide to the City's Timeless Shops". Rowman & Littlefield. p. 63. Retrieved November 14, 2017. ^ McGee, Harold (2004). On Food and Cooking. New York: Scribner. p. 39. ISBN 978-0-684-80001-1. ^ Peter Genovese. "Kohr's". The Jersey Shore Uncovered. pp. 57–60. ^ "The History of Frozen Custard". Ollie's Frozen Custard. Archived from the original on October 17, 2016. ^ "Custard-ology 101". Just Indulge. Archived from the original on September 24, 2012. ^ "What is Frozen Custard?". ^ "Andy's has frozen custard! Great! So, what is it?". Archived from the original on April 20, 2009. ^ "All Locations". Andy's Frozen Custard | Ice Cream. Retrieved 2019-03-26. ^ "FDA Frozen Desserts 21 CFR 135.110(a)(2)". FDA. Retrieved 17 July 2010.